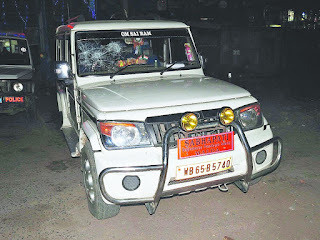 Two boys in Malda today died when a Trinamul rural leader fired from inside his car to scare away a mob that was chasing his SUV minutes after it had knocked down a cyclist. Pabitra Roy, the Englishbazar Trinamul panchayat samiti chief, was arrested this evening. One of the two boys, 19-year-old Ashim Mondal, was playing cricket while Rahul Paswan, 17, was nearby when both heard people shouting and rushed to see what had happened. Eyewitnesses said that someone rolled down the windows of the car and fired. Ashim died on the spot. Rahul died in Jangipur, Murshidabad, when he was being brought to Calcutta for treatment. Both boys had suffered head wounds. Before his arrest, Roy spoke over phone, trying to defend his act of shooting as self-defence. He said people had started throwing stones at his car when it was about a kilometre from Malda town. He said some people fired at the Mahindra Bolero, a claim that could not be confirmed with police. 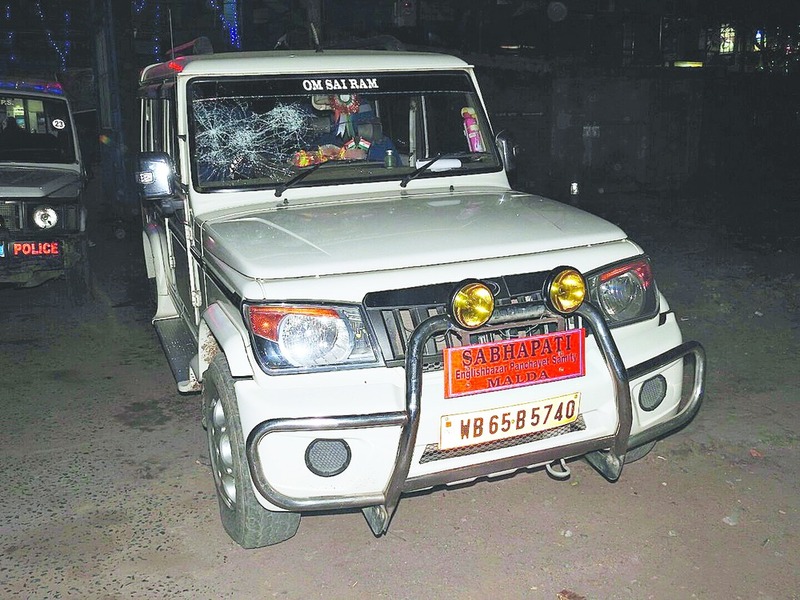 "My vehicle had hit a cyclist after which some locals attacked it. Stones and bricks were thrown at the vehicle and several people, among them a number of drunks, encircled my car. Even bullets were fired at me. I was forced to fire in self-defence from my gun," he said. Trinamul sources said Roy possessed a licensed gun, which he had acquired about four months ago. Asked why he did not fire blanks to deter the mob, Roy did not reply. Sources said that around 3.30pm today, the SUV (bearing number WB65 B5740 and a red plate that had "sabhapati" written on it), hit a cyclist in Kulipara More in the Baghbari area, about a kilometre from the town. The cyclist was injured. "Local people started chasing the car and stopped it half a kilometre from the accident spot. As they approached the vehicle, someone inside the SUV rolled down the rear window and started firing," a police source said. "The people ran helter-skelter but two persons suffered bullet wounds. One of them died on the spot," the police source said. The SUV sped away. Residents informed Englishbazar police station. After some time, the police found out that the SUV was parked outside Englishbazar police station. Its windscreen was partially cracked, said an officer. The two injured boys, Ashim Mondal, 19, and Rahul Paswan, 17, were taken to Malda Medical College and Hospital. Doctors declared Ashim dead and late at night said Rahul should be taken to Calcutta for treatment. Ashim's family said the boy was playing cricket minutes before. "My son was playing cricket nearby. As some locals raised the alarm, he ran to see what had happened. Somebody in the vehicle started firing. My son was hit in the head and died," Rabina, Ashim's mother, said. Arjun, Rahul's brother, said when "people gave the SUV a chase, my brother ran with them. He was shot in the head." A police officer said that eyewitnesses told them bullets were fired from both the rear windows. "We are trying to find out whether there was anybody else in the vehicle and whether they were carrying more than one firearm, that is, other than the gun of the sabhapati," the officer said. Prasun Banerjee, the Malda superintendent of police, said: " Roy will be produced in court tomorrow." Moazzem Hossain, the Malda district Trinamul president, said the party "will not intervene in the issue in any manner".